Easter weekend was a bit confusing, as we went on an autumn getaway on what we normally think of as a spring weekend. And to make it more confusing, we experienced temperatures ranging from about 3 to 29 c., in an area where both apples and strawberries are currently in season. WTF? 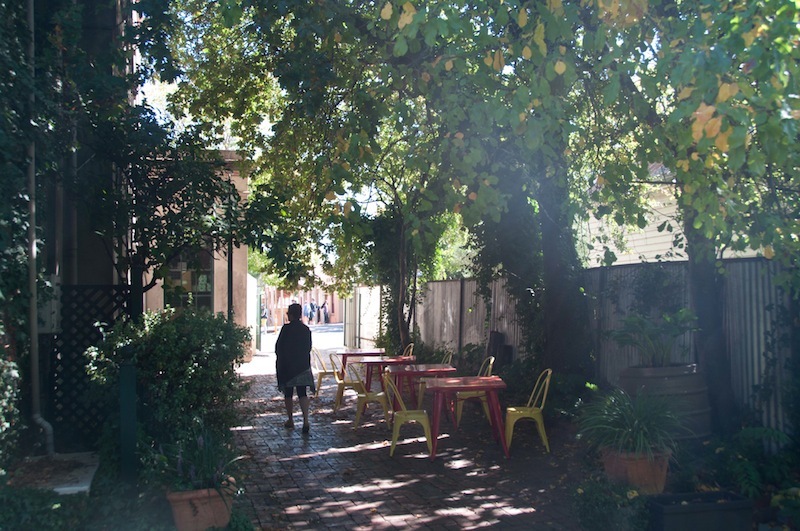 Walking through this courtyard at Provenance one night after dinner, we came across a brush-tailed possum. Rural Australia is really cool! On our New Year vacation, we met people who told us we needed to go to Beechworth, a well-preserved, historic gold-mining town in north eastern Victoria. It is sort of on the north edge of where we spent NYE, in the heart of one of the Victorian wine and food regions. Taking their recommendations, we booked in at a B’n’B type place called Provenance, which boasts #31 on the Gourmet Traveler magazine top 100 restaurants in Australia. The apples we know what to do with. The chestnuts...well, first you have to prepare them, then figure out how to serve them. Our first experiment might be risotto. Provenance, Beechworth, and Indigo Shire (Australians, like Hobbits, use the term shire for regional government areas) were all we hoped for, and maybe more. A town of about 3500 people at an elevation of about 56o metres, Beechworth’s prime industry is officially tourism; given that most of this tourism is based around wine and food, their prime industry is really culinary delights! While Provenance was probably the best place we ate all weekend, all our meals in the region were amazing and we had a lot of incredible wines from small (and fortunately sort of obscure…) producers in the area. 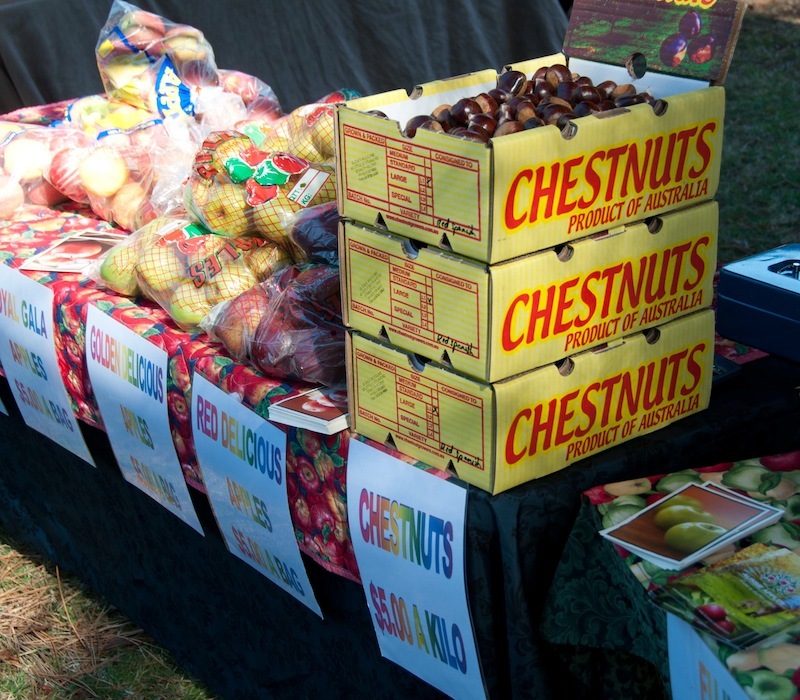 And we came home with apples, strawberries, beans, lettuce, carrots, chestnuts (fresh chestnuts!!! of course we don’t know what to do with them, but we will figure it out), all in season at the same time. As well as some great bread, honey from Beechworth Honey (more kinds of honey than you can count…), and a lot of cheese from a side trip to Milawa. And, of course, a boot full of really great local wines to keep us stocked up until our next venture into a wine region. There is so much to say about this weekend that it will probably take a few posts. This one will cover a few ‘highlights’. The big thing was that when we booked the trip in January, we did it based on the fact that we were going to have a four-day weekend for Easter. 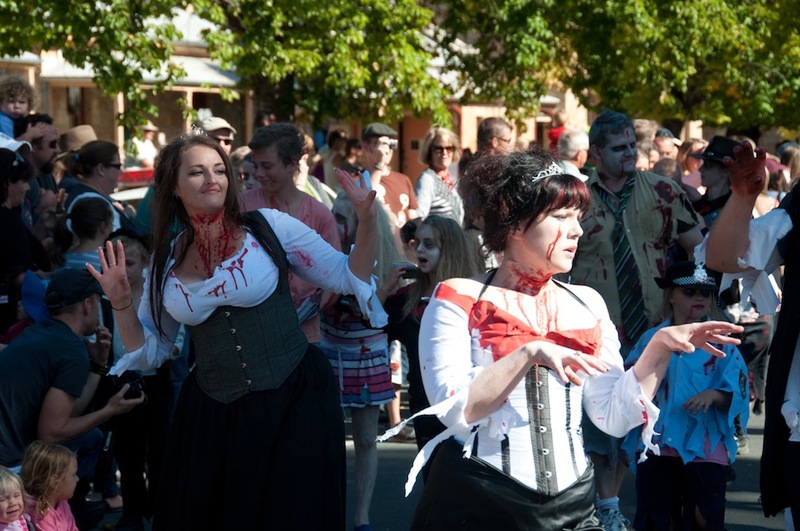 We didn’t know that it was the biggest weekend of the year in Beechworth, when about 15000 people descend on it (actually ascend to it) for the Golden Horseshoes Festival. So we were lucky that we not only had our accommodation booked but that the OCD one of us (Lisa edit: You’re welcome!) had actually booked all of our meals. With the restaurants all full on Saturday afternoon, people on the streets resorted to eating whatever they could find. Or whoever. Another cool thing about Beechworth is that it is part of the Murray to Mountains cycling trail that we wrote about at New Year’s. 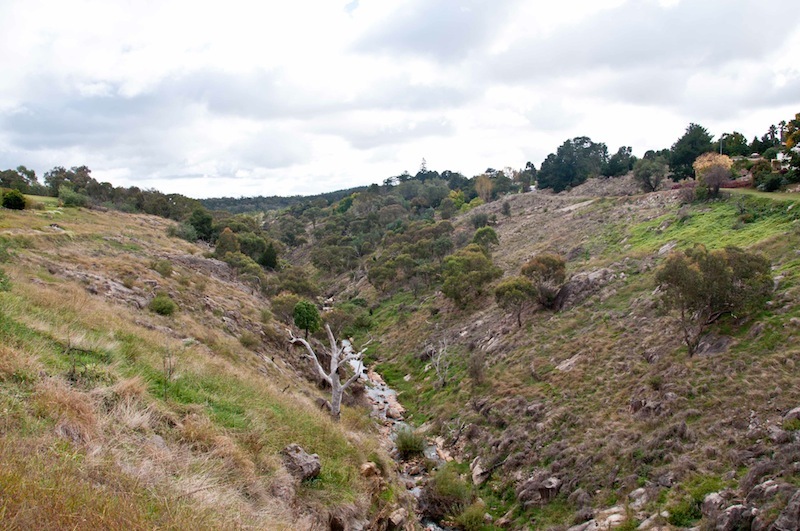 The original trail runs from Wangaratta to Bright, with an extension from Wang to Milawa. But there is a ‘spur line’ about 1/2 way down the Wang-Bright line, going from a town called Everton to Beechworth. So we did a bit of cycling. Going down into the gorge was easy. Coming back up? Let's just say that Dan and some guy we met on the trail had a nice chat at the top while Lisa and the other guy's partner came up the hill. 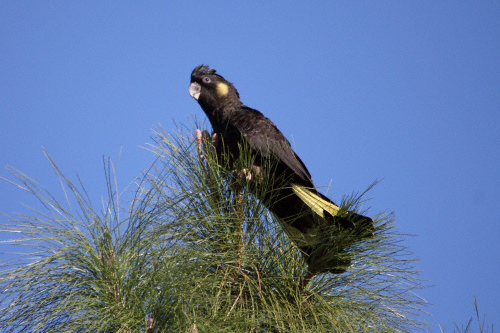 An amazing sight, the yellow-tailed black cockatoo in the wild! Sorry this isn't our photo. We do have some, but they are horrible. The trip up to Stanley also had a real highlight of the trip: we saw yellow-tailed black cockatoos! These birds aren’t ‘rare’, but they aren’t common. And they don’t live around Wagga. They are quite spectacular. We went hunting for them again on Monday with the car, and managed to find them again, and think it was possible it was the same group of four. They were pretty elusive. And these cockies weren’t the only good bird sighting we had. Just as we checked in to Provenance, there was a stunning red and green male Australian king parrot in a tree in the courtyard. And on a Sunday morning walk in town, we also saw a female. 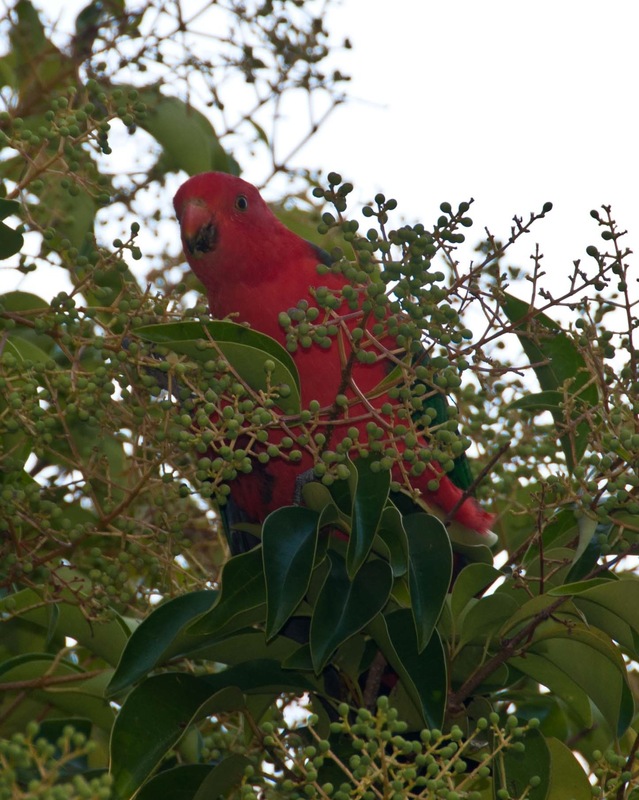 And we got up close and personal (to the point we think they might have been swooping at us to get us away from the young ones) with a bunch of crimson rosellas. And more close encounters with kookaburras. And on the way home, close to Wagga, we saw a lot of birds of prey: some nankeen kestrels, a black kite and one of the biggest, coolest birds in Australia – the wedge-tailed eagle. These things have a wingspan up to 3 metres, and while their preferred diet is rabbit they have been know to take out joeys (baby roos) and lambs! Yikes! This entry was posted in agriculture, apples, Beechworth, birds, festivals, parrots, rosellas, wine and tagged nature, travel, vacation. Bookmark the permalink.